West Windsor, N.J. – From June 17 through August 16, Mercer County Community College (MCCC) will once again open its West Windsor Campus to children and teens ages 6 to 17. Registration is currently underway for a diverse list of camp offerings designed to pique the interests of just about every child. The camp schedule ranges from the full summer to four-week, three-week and one-week sessions (full-day and half-day). All camp programs take place on the college’s West Windsor Campus, 1200 Old Trenton Road. MCCC youth camps include four main programs. Camp College provides a design-your-own activity schedule with more than 70 classes to choose from for children ages 6 to 13 in four-week sessions. One-week Specialty Camps are concentrated in one subject area. Tomato Patch Visual and Performing Arts Workshops are for young people interested in theater, dance, vocal music and art, with separate sessions for grades 4 to 7 and grades 8 to 12, as well as Master Classes for the older students. Sports Camps are one-week programs in five different sports for ages 6 to 13; most sessions are co-ed. The Camp College season runs from from June 24 through August 16. New 2019 Campus Kids classes are Animation Appreciation, Advanced Balloon Twisting, Graphic Design On a Dime, Creating Historical Musicals, Scratch for Young Coders, Introduction to Printmaking, Build A Business and more. Specialty Camps are designed to inspire a deeper appreciation and enjoyment for a particular subject or interest. 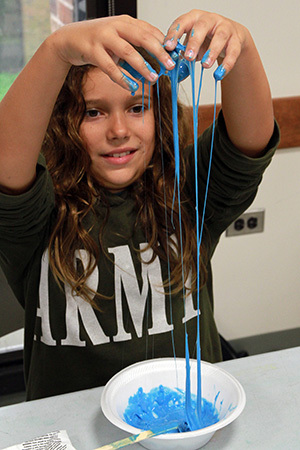 Campers may select from digital arts, science, arts and crafts, culinary arts, recreational activities and more. Ecoventure is a new one-week Specialty Camp that combines the love of the outdoors with learning about the environment. Activities include deep sea fishing, nature hikes, tubing, hunting for fossils, pocket knife safety, and proper fire building. In another new Specialty Camp, Build Your Own Guitar, children will design, construct and paint their very own electric guitar. In Drones and Flying Physics, campers will fly mini-drones, quadcopters and more. Tomato Patch Visual and Performing Arts Workshops are held five days per week (except during the Evening of the Arts final week of rehearsals and performances, which concludes on Thursday.) Students may chose from an array of concentrations and electives including stage combat, children’s theater, computer art, painting, drawing, jazz, musical theater, tap dance, cartooning and anime, hip hop, vocal ensemble, comedy, music video, and web video stage, the highly popular stage makeup class, and more. The college’s Athletics Department scores big with Sports Camps designed to help youngsters build their skills in specific sports while enjoying friendly competition. The camp season begins June 17 and ends August 9. All camps are staffed by college and high school coaches, as well as college athletes. Sports are offered in multiple weeks and include: Basketball; Field Hockey; Soccer; Sports Fitness and Readiness; and Tennis. Swim sessions are offered at the end of most days. More details about all MCCC summer youth programs are available at www.mccc.edu/camps or by calling 609-570-3311. Camp College will host additional information sessions on Saturdays, Feb. 16, March 16 and April 27 from noon to 2 p.m. in the MCCC Conference Center. 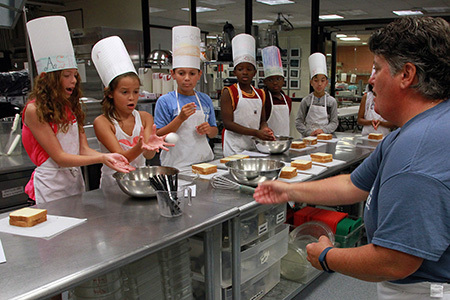 "Kids in the Kitchen,' one of numerous Specialty Camps, includes challenges like catching eggs! 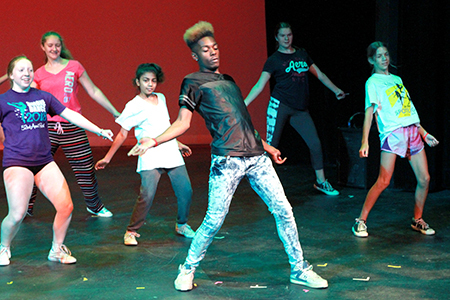 High energy dance numbers were an exciting part of Tomato Patch's 2018 Evening of the Arts performance for family and friends. Fun is a classroom assignment in Camp College's "Kooky Science" class, one of more than 70 Campus Kids options. 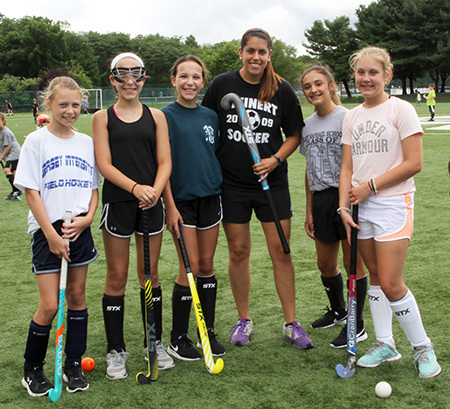 Field Hockey is among five Sports Camps offered in multiple weeks. Other sports are basketball, soccer, tennis, and sports fitness and readiness.